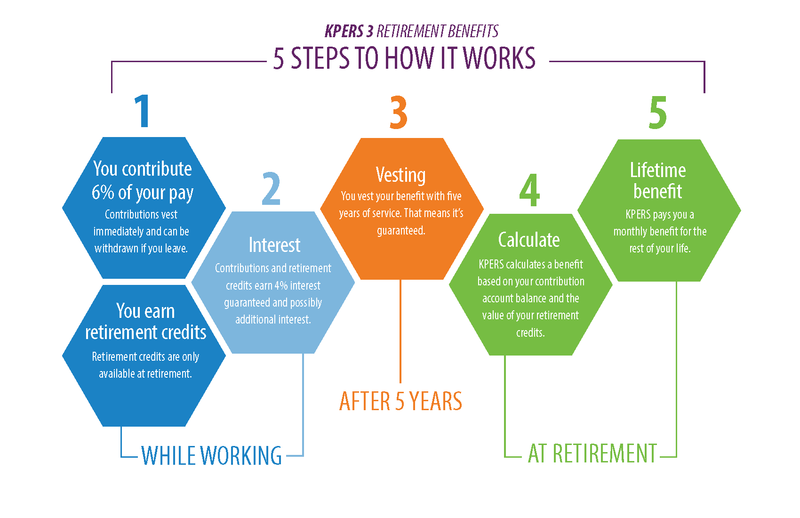 KPERS 3 Benefits Members hired January 1, 2015 and after. Welcome New Member- KPERS 3 from KPERS. Throughout your career, you contribute part of your salary to the Retirement System. Your employer also contributes. KPERS then invests these funds and, when you retire, pays you a guaranteed monthly benefit for the rest of your life. Kansas law requires that all eligible employees must be members. After 5 years of service, you are guaranteed a benefit. This is called "vesting." If you have participated in more than one Retirement System group, you may be able to combine years of service towards vesting. If you leave employment before retiring you can withdraw your contributions. As a KPERS 3 member you contribute 6% of your income. Kansas law does not allow you to borrow from your contributions. Your contributions earn 4% interest annually (paid quarterly). There is also a possibility of additional interest, depending on KPERS' investment returns. You earn retirement credits while working. They are based on a percentage of your pay and the number of years you’ve worked. You receive these credits quarterly and your annual credit rate increases the longer you work. They can only be used at retirement. Credits show as dollars. But that amount is not literally deposited into your account. Credits earn interest quarterly like your contributions. Your contributions are just one part of the funding that pays for your retirement benefit. Where does the rest come from? 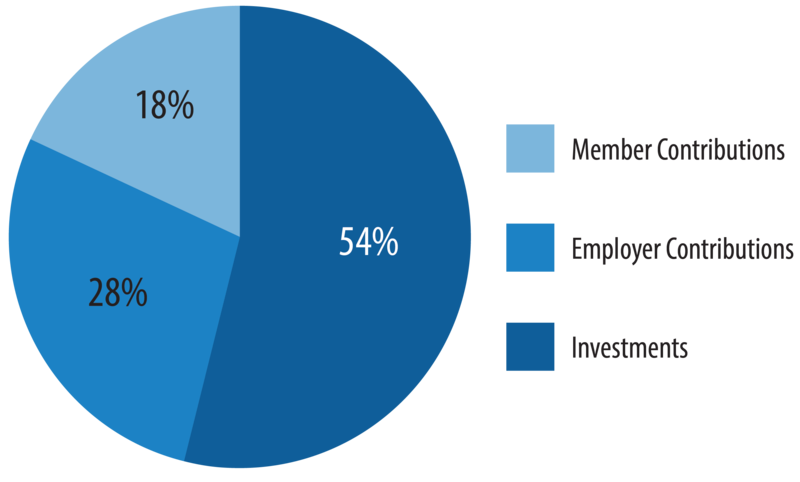 Employer contributions and KPERS investment returns. Your age and the amount of service you have determines when you can retire. The minimum age and service requirements differ between membership groups. At retirement, both your contribution account balance and your retirement credits are used to calculate your lifetime monthly benefit, along with some actuarial factors. All retirement options pay you a guaranteed monthly benefit for the rest of your life. You can choose from different payment options if you want to leave a monthly benefit for someone after your death or have a regular cost-of-living increase. You can also have part of your benefit paid in an up-front lump sum with a reduced monthly benefit. The base benefit is the 10-year life certain option. With a life-certain option, you will receive a monthly benefit for life. But, if you die within 10 years of retirement, your beneficiary will receive the same benefit for the rest of the 10-year period. Benefits are guaranteed for at least 10 years, no matter who receives them. And you will receive a benefit for life, no matter what. You can also choose a 5-year or 15-year life-certain option. They work the same way. You can provide a continuing monthly benefit for someone after your death. Survivor benefits are equal to 50%, 75% or 100% of your benefit and are paid for the rest of your survivor's life. To provide this continuing benefit, your monthly benefit is reduced. Your benefit decreases as your joint annuitant's benefit increases. At retirement, you can choose an annual 1% or 2% COLA option. 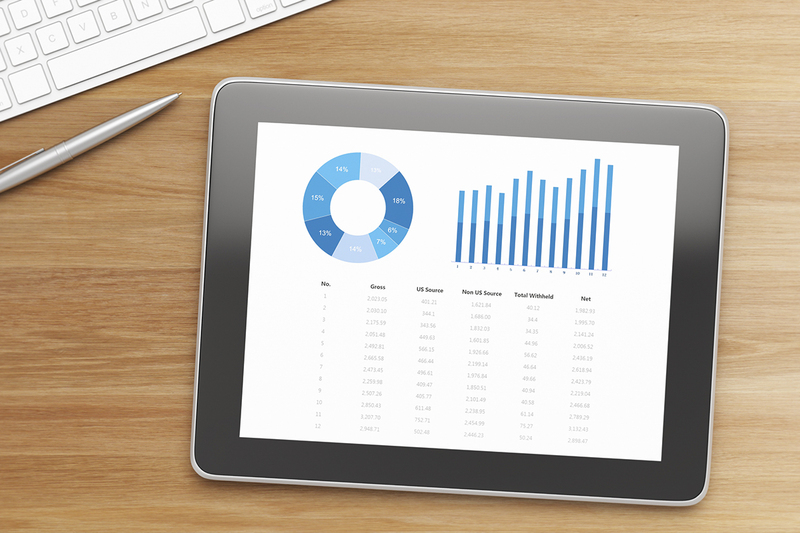 Your benefit is reduced initially to fund the annual increase. As a member of KPERS you have basic life insurance, death benefits, disability benefits and possibly optional group life insurance. Optional group life insurance is coverage beyond your basic life insurance. You pay the cost of this coverage through payroll deduction. Many employers offer optional group life insurance, including the State of Kansas. Check with your employer. With the "Accelerated Death Benefit," if you are diagnosed as terminally ill with 24 months or less to live, you may be eligible to receive up to 100% of your life insurance instead of your beneficiary receiving the insurance amount. Life insurance ends when you leave employment. However, you can continue your coverage on your own. After 24 months: You must be unable to perform the material and substantial duties of any occupation. To apply for KPERS disability benefits, contact your designated agent. The Retirement System returns your contributions and interest if you die. In certain situations, your spouse may be able to choose a monthly benefit instead of receiving your contributions. Please see Surviving Spouse Benefit Option for details. If you are diagnosed as terminally ill with 24 months or fewer to live, you may be eligible to receive up to 100% of your life insurance instead of your beneficiary receiving the insurance amount. If you die from an on-the-job accident, there is an additional death benefit for your spouse. 1. KPERS retirement benefits (return of contributions and interest, or surviving spouse benefit). 2. Group life insurance benefits (basic and optional). You can add or change beneficiaries at any time by completing a Designation of Beneficiary form (K-7/99). For full details on beneficiaries see Naming a Beneficiary. You need to claim your KPERS contributions on your Kansas income Tax Return. This applies to all active members of all Retirement System plans. Read more tax information.